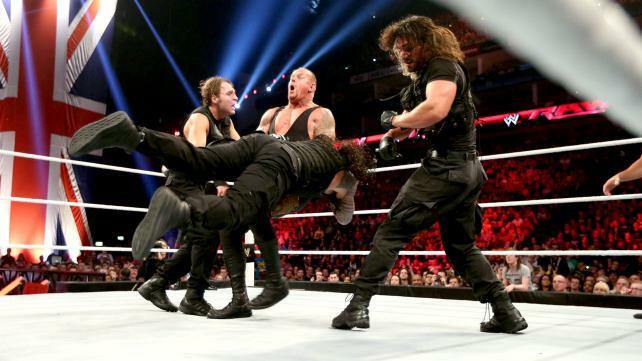 The Undertaker made rare appearances on both Monday Night Raw and Smackdown last week to take on the Shield in London. 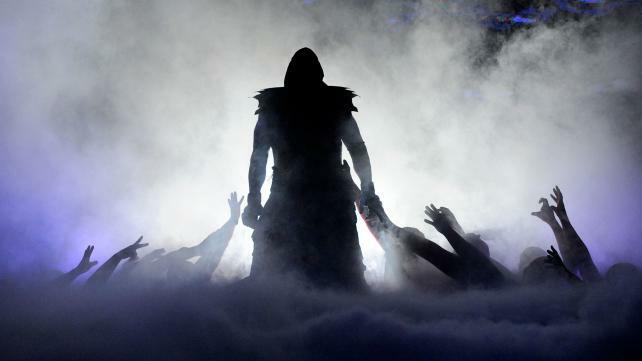 Last Monday’s episode of WWE Raw was all about the Undertaker appearing on the show for the first time in three years. The show from London was headlined by Taker teaming with Kane and Daniel Bryan against the Shield in a six-man tag match. Given the momentous nature of Dead Man’s return to WWE’s flagship show, it merits a fare share of attention as we get ready for tonight’s show from Columbus, OH. Ten (maybe eleven) new books on the list for this Wednesday. A+X #7 – Fairly certain issue #6 is where I’m planning to stop with this series, but I’ll give issue #7 a look at the store this week. The Giuseppe Camuncoli Iceman/Thor cover really caught my eye. AVENGERS #10 – The incorporation of elements from the New Universe in this series took me by surprise, but the promise of Omega Flight in this issue somehow feels even more unexpected. As much as I’m anticipating what’s next I’d rank this third of the four Jonathan Hickman written books that made their way onto my pull list for today. EAST OF WEST #2 – This series got off to a great start last month. I’m not really looking to add anything to my list, but this one is tough to pass up especially when it’s “Uncanny Hickman” week. Right now, this book is positioned at number two on the Hictogram. GUARDIANS OF THE GALAXY #2 – I certainly enjoyed the “point one” issue of Brian Bendis and Steve McNiven’s Guardians series more than issue #1 last month, though the bar was set pretty high. I still have a soft spot for Abnett and Lanning’s previous series, but I have high hopes for where this volume is headed. JUPITER’S LEGACY #1 – A new series from Image by Mark Millar and Frank Quitely. The solicit promises this will be the “the superhero epic that all future comics will be measured by.” I don’t know about all that, but it’s certainly something worth checking out. Millar’s work isn’t always my thing, but I do like Quitely. THE MANHATTAN PROJECTS #11 – I need to catch up on my reading for this title. It fell from the top of my reading list around issue #8 and I’m finding myself missing it. As a result it falls to fourth of this week’s four Hickman titles, but that doesn’t mean it’s anywhere near the bottom of my reading list. NEW AVENGERS #5 – This is honestly my favorite of the Hickman books shipping right now. It has an epic scope and it’s taking the concept of Marvel’s Illuminati into very unpredictable territory. The more conventional shipping schedule helps as I find myself with more time to consider each issue as I wait patiently for the next. UNCANNY AVENGERS #7 – Rick Remender, the Apocalypse Twins, Kang, and Havok. I’m so happy to see this book arriving more regularly and the continuation from Remender’s Uncanny X-Force is an added bonus. This will likely be the first book I read today. UNCANNY X-MEN #5 – Frazer Irving joins Brian Bendis taking the artistic reigns from Chris Bachalo. I’m a big Bachalo fan, but this is a welcome transition if we can’t have him for every issue. Can’t wait to see the fallout from Cyclops’ recruiting efforts at the Jean Grey School. WOLVERINE AND THE X-MEN #28 – I jumped in for the Age of Ultron tie in last week but I still have a number of issues to catch up on here. I’m contemplating stepping away from the series based on the last few that I’ve read and seeing Jason Aaron‘s recent reintroduction of Dog Logan. X-TERMINATION #2 – Finishing out the alternate timeline crossover. Not much else to say as I haven’t read much of it yet. Big week with twelve new books on my list. AGE OF ULTRON #6 – Things should pick up this time around given the way issue #5 ended last week. At the very least we’re getting an artist change and time travel. ASTONISHING X-MEN #61 – X-Termination Part 5. I honestly don’t know what possessed me to invest in this crossover after quitting Age of Apocalypse and X-Treme X-Men very early in their runs. I normally get Astonishing, so this would have been on my list regardless. CABLE AND X-FORCE #7 – Very much looking forward to Cyclops confronting Cable. Between the two of them and Hope, this issue should be a lot of fun. Larocca’s cover image is a great start. CAPTAIN MARVEL #12 – I need to catch up on my reading for this title. CYBER FORCE #4 – Free. DOCTOR WHO: PRISONERS OF TIME #4 – Got to read an advance copy of this book and it fits right in with what’s come before. It’s a good representation of the 4th Doctor, but not much in the way of the plot that’s running across the issues of the series. IRON MAN #8 – Going through the motions to finish out the Godkiller arc. At least I know Gillen’s Iron Man isn’t for me. JUSTICE LEAGUE #19 – Another title I need to catch up on. NOVA #3 – This has been to good to drop as I’d expected would happen after trying the first issue. WOLVERINE AND THE X-MEN #27AU – An Age of Ultron tie-in. Not sure how many of the books I read regularly will have an “AU” issue, but this one looks decent. X-FACTOR #254 – It feels like a lot of time has passed since the last issue and that’s making the Hell on Earth War feel even longer. I’m definitely enjoying it, but the rate other books are shipping at right now makes this feel slow. Given the time I have for reading lately, I prefer slow. X-MEN: LEGACY #9 – Another eye-catching cover from Mike Del Mundo and more Blindfold inside. AGE OF ULTRON #5 – Last issue delivered a twist on what the heroes are actually going though in the new Ultron-controlled world. Things are unfolding somewhat slowly, but the accelerated shipping rate helps. Of course that means putting a lot of dollars out over a short period of time which is doesn’t help at all. AVENGERS #9 – This book is excellent. ‘s work in both this series and New Avengers is a breath of fresh air. I’m not crazy about the main antagonist, Ex Nihilo (honestly, a lot it is the name), but I’m loving the other cosmic elements Jonathan Hickman is employing. Hickman is responsible for a lot of great stuff coming out from both Marvel and Image with The Manhattan Projects and and his latest East of West. He’s certainly a creator to check out. BATMAN #19 – DC’s solicit for this issue incorrectly stated that Andy Kubert was returning for another issue. No offense to Andy (I do like his work), but I couldn’t have been more pleased to see that regular series artist Greg Capullo was back to continue his epic run with writer Scott Snyder. I’m not sure how the next few issues will lead into the duo’s next big story arc, Zero Year, but the cover to the issue (particularly what’s inside the gatefold) clearly shows we’re headed into interesting territory. SAGA #12 – I’ve heard talk that this book is due for a hiatus, and it appears it will follow this issue. I have no doubt Brian Vaughan and Fiona Staples will leave things on a cliffhanger, but most of the attention the book received this week was for reportedly being banned from distribution through Apple App’s store. It’s not quite as simple as all that though and the bottom line is that the book will be available digitally soon. UNCANNY AVENGERS #6 – It looks like this title is getting back on track following the delays of Rick Remender and John Cassaday‘s first arc. New regular series artist Daniel Acuna takes over as of this issue, and I’m looking forward to seeing it on the shelves more regularly. More Havok is always welcome. UNCANNY X-MEN #4 – Chris Bachalo is one of my favorite artists and I’m very happy to see another issue of this series from him. Uncanny hasn’t shipped at the rapid pace that Brian Bendis’ All New X-Men did at launch and I’m hoping the more reasonable schedule means more Bachalo. This issue ties into last week’s All New X-Men #10 as Cyclops’ team makes an unexpected and unwanted visit to Wolverine’s Jean Grey School on a recruiting drive. X-TREME X-MEN #13 – Part 4 of the X-Termination crossover and the last issue of Greg Pak’s X-Treme X-Men. I’m not going to lie, I’m really just going through the motions with this crossover. I likes the promise of books like this one and Age of Apocalypse as they focus on alternate realities, but they did nothing for me in practice. The fact that these final issues of the books involved is part of what’s kept me buying for some reason. The Undertaker extended his WrestleMania undefeated streak to 21-0 against his latest challenger C.M. Punk. At the age of 48, the “dead man” was part of the match of the night at WrestleMania 29. Last night was not the best WrestleMania is history, but not the worst. The ultimately felt unsatisfying. There’s no one thing that was missing, but this definitely wasn’t an event that felt like the culmination of the past year’s stories. Sure, Triple HHH and Brock Lesnar’s feud goes back to last Summer, and the Rock versus Cena goes all the way back to WrestleMania 27, but those were two lackluster matches on a four-hour card. The show did leave us with a lot to talk about, so in that regard it was a success.